North Wales Police has said a 28-year-old man from Chester was arrested on suspicion of wounding following an incident at Bethel Place flats on Sunday which prompted a large scale emergency service response. Police were called to the flats following reports of an alleged assault just after 9am on Sunday morning. Eyewitnesses say as many as 10 police and ambulance service vehicles were seen outside and around the back of the High Street flats at around 9am. A 28-year-old man was taken to hospital by ambulance for treatment for a “non- life-threatening injury” a police spokesperson has said. “We were called at approximately 9am on Sunday morning to reports of an incident on Bethel Place, Connah’s Quay. An area outside the flats was cordoned by police on Sunday morning as officers and paramedics dealt with the incident, the main emergency response wound down at around 10.30am. Crime scene investigators dressed in white forensic suits were then seen working outside the flats. 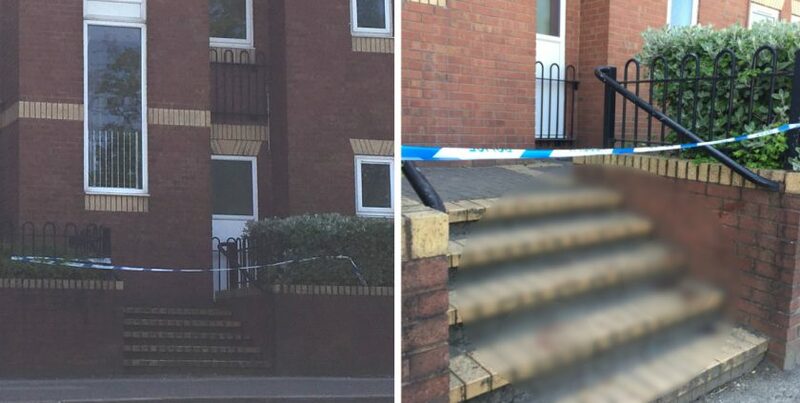 The crime scene teams completed their work by around 2pm, police tape remained in place preventing anyone from walking to the entrance of flats numbered 10 to 16. Two pools of dried blood could still be seen on the steps with a trail of blood leading up towards the entrance of the flats. Local news outlets directly linked the video to the Bethel Place incident on Sunday morning despite not being formally confirmed by police. Bethel Place was at the centre of a police murder investigation following the death of Matthew Cassidy in May 2017. The 19-year-old from Merseyside was stabbed nine times in the stairwell of the flats in a dispute between rival drugs gangs. David Woods, 20, from Liverpool pleaded guilty to his murder, Leslie Baines, 48, from Deeside was found guilty after a two-week trial at Mold Crown Court. They will both be sentenced on 21 May.